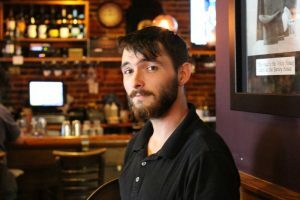 Kevin Roark, who lives in Andover is often referred to as “that little funny guy” by diners at the Barley House in Concord. Kevin Roark waits tables at the Barley House in Concord. On this day, he stands at the host’s station, greeting guests as they walk through the door. “Two?” Roark asks a pair of women who have come in for lunch. These women don’t seem to recognize Roark. But he has a reputation among the regulars here. You may have encountered a server like Roark at other restaurants. A little theatrical or over the top. When they agree, Roark smiles. “Exceptionally difficult!” he says. Roark is 26. He lives in Andover. He’s on the short side, thin, and wears a beard. And if he’s your waiter, he’ll bring more than just sweet potato fries and sangria to the table. Expect a quick wit, a sense of humor, and a quote from a film like Top Gun or The Princess Bride. “My name is Inigo Montoya. I search for the six fingered man!” is how Roark often introduces himself. Sometimes he busts out a foreign language. He knows bits of German, French, Spanish, and Japanese. His performance calls to mind an actor starving for attention, but he’s not a theater guy. In fact, big crowds aren’t his thing. He prefers the intimacy of a small group gathered around a table, and he uses humor to pry his way into a better understanding of what his guests need. But beyond making him more effective as a server, he uses humor for a more noble purpose: In an age when you can order your food with an app or on a screen mounted to your table, Roark wants to use humor to humanize the job of serving customers. But Roark’s approach can be polarizing, and this fact is not lost on him. So when he says, for example, “My name is Inigo Montoya, I search for the six-fingered man,” he’s telling a joke, but he’s also reading your response. Sometimes the jokes don’t work the way he intends. Sometimes the joke is a dud. But sometimes guests aren’t in the mood for Roark’s strong personality. If he gets a bad vibe, he dials it back. That great experience is Roark’s singular focus. He’s even concerned about my experience as I follow him around with a microphone.